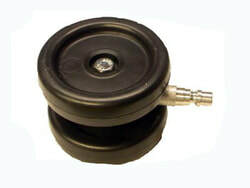 Blowfish stabilizer- stabilizes the camera from 2.5" to 13 x13" flue liner. Bows are made of nylon for flexibility. Will pass thru 8" Prefab dampers and masonry heat form tubes. California Roller wheels with Kwik-Lock stem is a great tool to have if you do a lot of thimbles, smokes chambers, and offsets. It connects to the top of the Blowfish or a Chim-Scan® camera. The only difference between the rovac blowfish and the standard blowfish are the rod conections. The Rovac Blowfish has a female rovac at one end and camera stub adaptor on the other. The Camera stub adaptor has a set screw that you tighten on the camera stub so that you can push and pull the camera inside the chimney.